The Little People Big Dreams series is written for young children to introduce them to important figures from history (and also some important living people) by talking about what their lives were like when they were children. Most of the books in the series have quite cartoonish, simple art, but this one is an exception, which seems appropriate given the subject matter. Instead, the illustrator, Sveta Dorosheva, has used realistic black and white line drawings, with the only accent of colour being the bright orange cover of Anne's diary. The art beautifully captures Anne's childish joy, depicting her as a real, living girl who is more than her eventual tragic death. The text, by Isabel Sanchez Vegara, handles the story of Anne's imprisonment and death sensitively and age appropriately, but without just glossing over the reality of it. The book manages to end on an inspiring note and is a beautiful read, suitable for children aged about 8 and up. "When Anna Swan came into the world, people chattered. They whispered over tea and gossiped across fences. Because even when she was small, Anna was...tall." 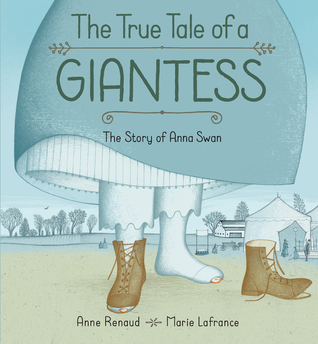 This picture book is the story of Anna Swan, a real-life giantess, who was born in Nova Scotia in 1849 and went on to become part of PT Barnum's Gallery of Wonders. Anna weighed 6kg when she was born and by the age of six she was taller than her mother and could see eye to eye with her father. At seventeen, she reached her full adult height of 2.4 meters tall. She was called "the Infant Giantess", and people travelled great distances just to see her. She felt out of place and awkward except when she was outdoors, or around the other unusual people living in Barnum's museum. Eventually, she married another giant, a man almost as tall as her, and they settled in a house that was built to accommodate both them and their smaller guests. The True Tale of a Giantess is beautifully illustrated by Marie Lafrance, with coloured drawings full of intricate details like the patterns on the wallpaper and Anna's dresses. The text tells an inspiring tale of a girl who just wanted somewhere she could fit in. Disclaimer: I was given a complimentary copy of this book by Kids Can Press, via NetGalley, in exchange for an honest review. This new book in the Little People, Big Dreams series talks about the life of the now immensely popular author Jane Austen, from her childhood, when she wrote sketches for the amusement of her friends to her adult life, when she suffered the disappointment of a broken engagement and began her life as a novelist. It is illustrated by Katie Wilson with watercolour paintings which suit the text. Little People, Big Dreams: Jane Austen will inspire young girls (or boys) who want to be writers, but may have been told, as Jane was, that it's a silly idea and not worth pursuing. 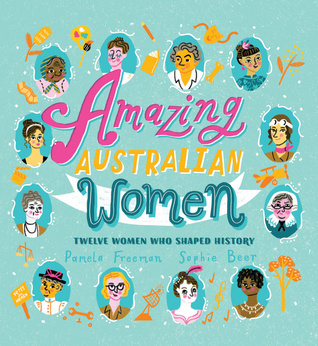 Amazing Australian Women is a collection of short biographies of twelve women who lead extraordinary lives. Some are probably already familiar to the reader, like opera singer Dame Nellie Melba. Others are less well known than they deserve to be, such as Tarenore, an Indigenous resistance fighter from Tasmania, suffragist Mary Lee, and teacher, writer and disability rights activist Tilly Aston, who fought for blind people to gain the right to vote. The text is interspersed with illustrations, which since I read it on my Kindle were in black and white, but which I'm told are in full colour in the paperback version of the book. Amazing Australian women would suit readers aged about 8-12 years and would make a great addition to a school library, or an excellent gift for a little girl in need of inspiration to work hard towards her goals in spite of opposition. Disclaimer: I was given a complimentary copy of this book by Hatchette Books Australia, via NetGalley, in exchange for an honest review. 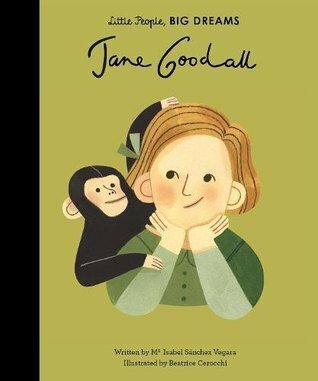 Little People, Big Dreams: Jane Goodall tells the story of Jane, who was given a toy chimpanzee when she was little and raised on stories about Tarzan. Instead of going to University, she saved up to buy a ticket to Kenya, where she met a scientist called Louis Leaky. Jane volunteered to study chimps in the wild, gaining their trust by sitting quietly near them and observing. Her observations and insights challenged many of the assumptions scientists had previously made about chimps. Jane went on to get her doctorate at Cambridge and spent many years campaigning for animal welfare. This book is illustrated with brightly coloured paintings by Beatrice Cerochii and the text is simple but engaging. It would suit readers aged around seven years and up. I have not heard of 'Little People - Big Dreams' series of books for girls until I read this article. What a great selection of non- fiction books for young girls. They will be on my list of books as Christmas Birthday gifts for my granddaughter.